Most people think of topaz as a transparent golden yellow stone. Nevertheless, this stone also occurs colorless as well as orange-yellow, red, dark sherry, light green, blue and pink. 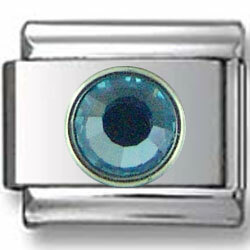 In our collection light blue Turquoise Birthstone is presented on a top-quality stainless steel support. Turquoise is embedded in a nickel-free stainless steel and outlined by hand with silver toned casing. It holds the distinction of being the stone with the widest range of curative powers. The stone will sparkle even more laid by side with December Zirconia flower Birthstone of the same cutting design or Oval December turquoise Birthstone Italian charms.